Desc: 14 kt. 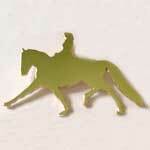 white gold Dressage rider and horse pendant. The pendant has a bright polish finish. See SK166 for this pendant in 14 kt. yellow gold.